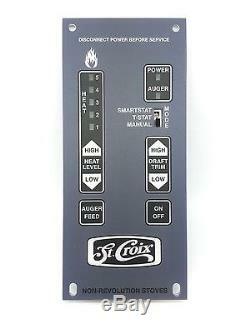 CROIX PELLET / CORN STOVE CONTROL BOARD (OEM). York Insert - Only if your model currently has a digital LED board. If you have the original rotary style turn knob board you will require the retro-fit kit. Please message us or see our other listings. NOTE: Pepin, SCF050 and Revolution Furnace will use a different board. NOTE: If your stove has a rotary style /Turn knob control board there will be a different control board'Retro-kit' required. 80P22348-R / 80P30523B-R / 80P52632-R / 80P30523-R. Newest Style - Instructions included to set properly for your model. Replaces all previous touch pad control boards on the above mentioned models. NOTE: There is a pigtail wire as you will see pictured. This is ONLY used for the Element model; it connects to the Photo-eye wire. Croix models this will be left disconnected. Simply tuck it so it does not get pinched; DO NOT remove it. Happy to assist with questions. We guarantee control board to arrive in brand new perfect condition. Over 25 years of trusted value and commitment to our customers. The item "St Croix Greenfield, Auburn, Lancaster, York Control Circuit Board 80P30523-R" is in sale since Tuesday, November 7, 2017. This item is in the category "Home & Garden\Home Improvement\Heating, Cooling & Air\Fireplaces & Stoves\Replacement Parts". The seller is "esesstoves" and is located in Dale, Wisconsin. This item can be shipped worldwide.